On this day in 1958, the F-4 Phantom II had its first flight. The F-4 Phantom II is a two-seat, twin-engine, all-weather, long-range supersonic interceptor/fighter/bomber that was originally developed for the Navy by McDonnel Aircraft. It entered service with the Navy in 1960 and, after proving how highly adaptable the aircraft was, was also adopted by the US Marine Corps and the US Air Force. By the mid 1960’s, it had become a major part of their perspective airwings. 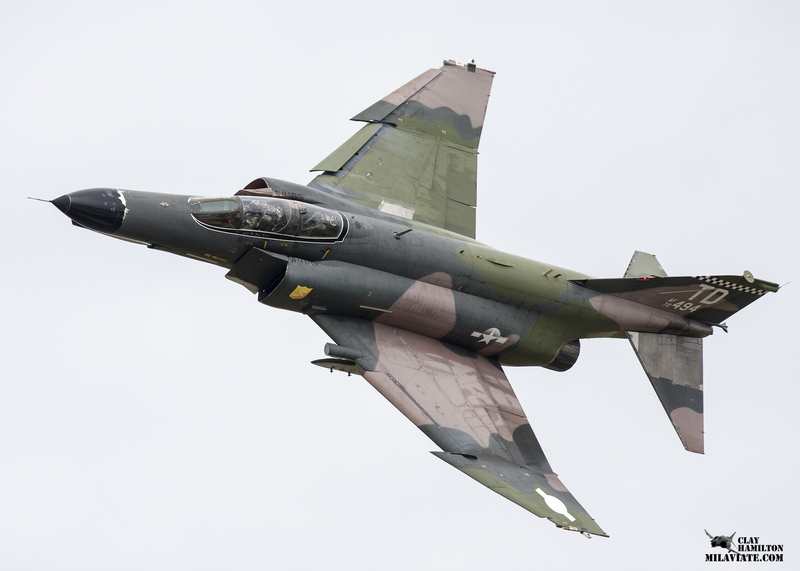 The F-4 saw extensive use in the Vietnam War as an air superiority fighter for the Navy and Air Force and also in ground-attack and reconnaissance roles late in the war. The F-4 holds the distinction of being the last fighter of the 20th century that was flown to achieve “ace” status, with the USAF having one pilot and two WSO’s and the USN having one pilot and one RIO achieve five aerial kills. It also holds the distinction of being the only aircraft to serve with both the US Navy Blue Angels (who flew the F-4J from 1969-1974) and the US Air Force Thunderbirds (who flew the F-4E from 1969-1973). One major issue with the F-4 Phantom was the copious amounts of black smoke the original J-79 engines produced at military power, making the F-4 very easy for enemy forces to spot. To address this issue in combat, pilots would run one engine at reduced power and the other at afterburner. This produced an equivalent amount of thrust as running both engines at regular power and eliminated the smoke. This issue was rectified with the upgrade to the J-79-GE-17 smokeless engines that were installed in the F-4 starting in 1972. The F-4 remained a major component of US air power until it began to be replaced by more modern aircraft, mainly the F-14 Tomcat, F/A-18 Hornet, F-15 Eagle and F-16 Falcon. The F-4 Phantom is currently in service as the QF-4 Phantom II and is being used as a remotely piloted aircraft for use in surface-to-air and air-to-air missile tests. And, on a personal, note… PHANTOMS PHOREVER!!! !